We can collect from almost anywhere on the UK mainland within 60 minutes of booking and deliver direct to anywhere in the UK, Ireland or Europe. 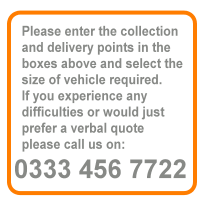 Use the panel on the right to get an instant online price estimate for same day courier delivery between any two addresses on the UK mainland (please call for a price for multiple collection or delivery points). If you’re happy with the price just give us a call to confirm it, supply us with a few details and we’ll be on our way to collect. 1) All business undertaken is subject to our Conditions of Trading. 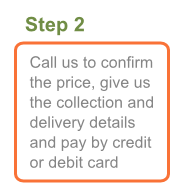 2) Collections from most areas can normally be carried out within 60 minutes of booking. Collections from very rural or remote areas, such as the Scottish Highlands or West Wales may take slightly longer. 3) Deliveries by motorcycle are available only within larger city centres. 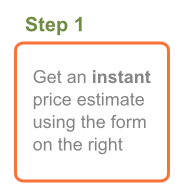 4) The online price estimate generated includes all road tolls and similar charges where applicable. Please call for a price for journeys involving ferry crossings. 5) Extra collections or deliveries, excessive waiting or loading time, unanticipated parking charges etc, will be added to the final cost of the delivery. 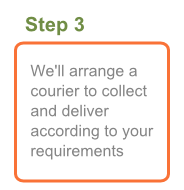 6) Cancellations which occur after a courier has been despatched will be subject to our minimum charge. 7) All prices quoted are subject to VAT at the current rate. 8) Errors and omissions excluded. Collection Town or PostcodePlease enter the full or partial Postcode of the collection point where available, or the town name. Delivery Town or PostcodePlease enter the full or partial Postcode of the delivery point where available, or the town name. Bike, Car or Small VanSmall van maximum load: 400kg, 1 pallet, 1 metre high, 1.5 metres load length. Extra large van Extra large van: Up to 4.3 metres load length, up to 1350kg maximum load, up to 1.8 metres high. The van provided will be suitable for the load but cannot combine all these maximums. Longer or higher vans carry less weight.